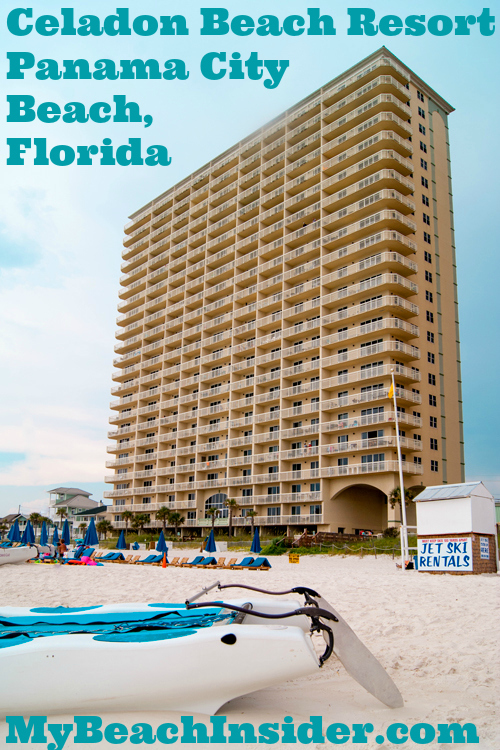 Celadon Beach Resort is a gulf front condominium located on the west end of Panama City Beach, Florida. Many of the owners rent out their condos as vacation rentals. Celadon Beach Resort has 22 floors and 9 units on each floor, except floors 1 and 2 which have 6 units and 7 units respectively. 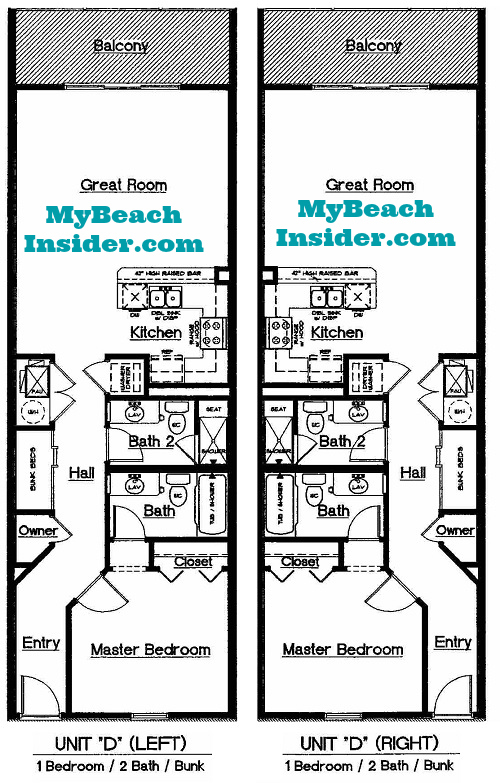 There are 4 basic types of floor plans that have small variations, such as being mirrored. In the picture to the right, you’ll notice a gap in the bottom right of the condo building. Instead of units, there is a gulf front pool in this area for all guests to enjoy. 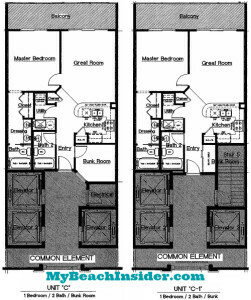 Celadon has two types of one bedroom/two bathroom with bunk room floor plans. The first is called Unit C and can be found in units that end in 05. Unit C is 805 square feet. There is only one exception, unit 2305 which has a Unit C-1 floor plan. I’ll discuss the differences after I describe Unit C.
You enter Unit C from the elevator lobby on each floor. As you enter the unit, find a bunk room on your right and and the first bathroom on your left. A little further ahead, you’ll find the kitchen on your right. As you enter the kitchen there is a pantry on your right. Continuing down the entrance, there is a utility room on your left. Just past the utility room there is an owner’s closet that will likely be locked. You’re now entering the great room/dining room combo. Straight ahead is a sliding glass door that leads to the balcony. On the left wall in the great room there is a door to the gulf front master bedroom. The master bedroom has a sliding glass door that leads to the balcony as well as a master bathroom. As you enter the master bathroom area, a closet will be on your left, followed by his and her vanities. The toilet and bath/shower combo are in a separate closed off area straight ahead. Unit C-1, located in unit 2305, is slightly different that the regular Unit C’s. As you enter the unit, there is a bunk area immediately on your right instead of a bunk room. That’s the only difference. 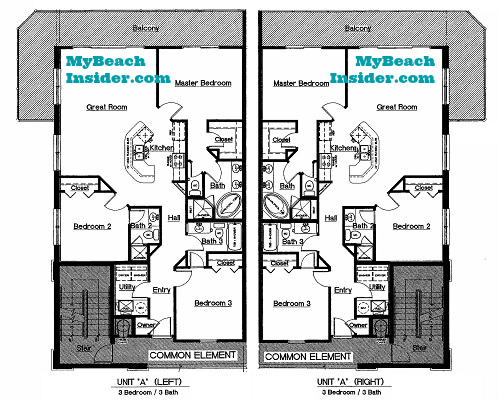 The second one bedroom/two bathroom with bunk area floor plan in Celadon Beach Resort is called Unit D. Unit D is 846 square feet. There are two versions that are identical except for the fact that they are mirrored. The left version can be found in units that end in 03 and 06 while the right version can be found in units that end in 04 and 07. As you enter the left version of this floor plan, you’ll wall down the entry into the hallway and find the entrance to the master bedroom on your right. The master bedroom has a closet and a private master bathroom with one sink and a shower/tub combo. Continuing down the hallway, you’ll see an owner’s closet on your left that is likely locked. Just past the owner’s closet on your left is the bunk area. Across from the bunk area, on your right, is the second bathroom that is shared with the unit. Just past the second bathroom, there is a washer/dryer closet on your right and a utility closet on your left. Continue walking into the unit and you’ll be in the dining area and to your right is the kitchen. Straight ahead is the great room which has a sliding glass door that leads to your private beach front balcony! 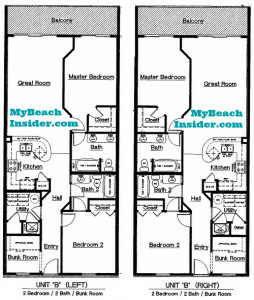 The right version of this floor plan is an exact mirror copy of what I described above. 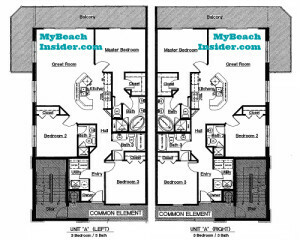 The Celadon Condos only have one two bedroom/two bathroom with bunk room floor plan and it is called Unit B. This unit is 1,157 square feet. The left mirrored version of Unit B can be found in units that end in 02 while the right mirrored version of Unit B can be found in units that end in 08. Entering the left version of the floor plan, you’ll see a bunk room on your left hand side. As you walk further down the hallway, you’ll find the first bedroom on your right. 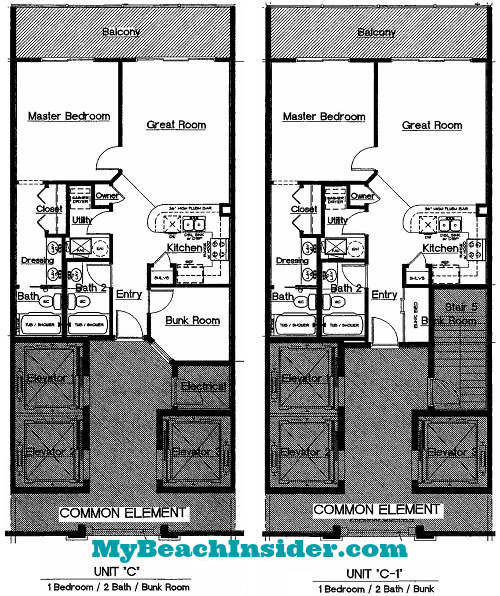 It has a closet and access to a bathroom that is shared with the rest of the unit. Across from the first bedroom, there is a utility closet that includes a washer/dryer area. The hall takes a small turn and just past that you’ll see the hallway entrance to the first bathroom. Just ahead on your left is the kitchen. As soon as you enter the kitchen there will be a pantry on your left. As you continue past the kitchen you’ll enter the great room/dining room combo which has a sliding glass door that leads to your gulf front balcony. In the great room, there is a door to the master bedroom on your right. The master bedroom has a walk-in closet, a sliding glass door to the balcony and a private master bathroom. The master bathroom has his and her sinks. The right version of this floor plan is an exact mirror copy. Celadon Beach Resort has one three bedroom/three bathroom floor plan, Unit A, that has a minor variation for units on floors 1 and 2. 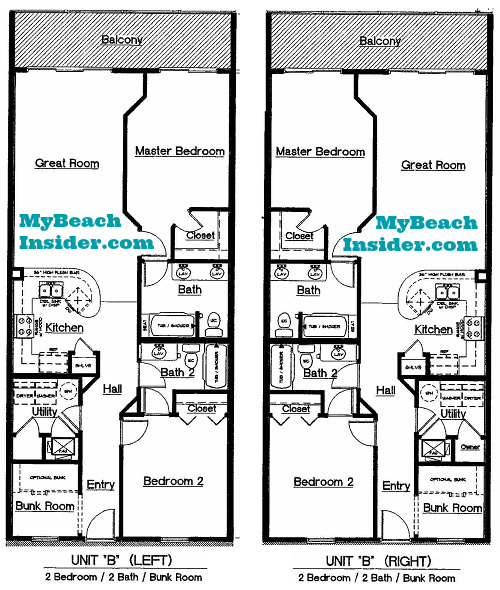 This floor plan also has a mirrored version and can be found in units that end in 01 or 09. Unit A condos are 1,400 sq ft.
As you enter the left version of Unit A, you’ll see an owner’s closet on your left that will likely be locked. Just past the owner’s closet, you’ll find the utility room on your left that will contain a washer and dryer. Further down the entry on your right is the first bedroom. 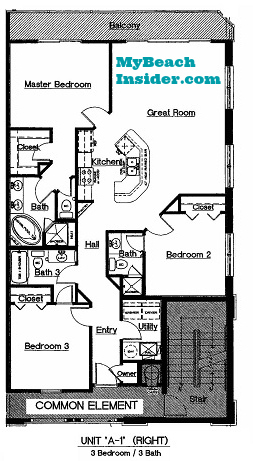 This bedroom has a closet and access to a bathroom with a shower/tub combo that is shared with the rest of the unit. As you transition from the entry to the hallway, you’ll see the entrance to the shared bathroom on your right. Straight ahead is the kitchen. As you walk to the left, you’ll see the entrance to the second bedroom. The second bedroom has a closet and a private bathroom with a stand up shower. It also has a window that will face east in units that end in 01 and west in units that end in 09. Just past the entrance to the second bedroom is the great room/dining room combo. This area has two windows that face east in 01 units and west in 09 units. It also has sliding glass doors that lead out to the balcony, which is a wrap around balcony in units on floors 3 through 23. On floors 1 and 2, it is just a standard balcony as seen in the A-1 floor plan to the left. Finally, the master bedroom is found by either walking straight through the kitchen from the hallway or through the great room on the right wall. The master bedroom has a sliding glass door that leads to the beach front balcony, a walk-in closet and a master bathroom. The master bathroom has a water closet, his and her sinks, a corner shower and a large tub. The right version of this floor plan is an exact mirror copy, except for on floors 1 and 2 where there is no wrap around balcony. Instead, you’ll just have a standard balcony. Coming To Panama City Beach Soon? Learn About The Beach! If you’re headed down to Panama City Beach, I’m sure you’re excited about your vacation. Do yourself a favor and learn a bit more about the city before you arrive from an insider, a Panama City Beach area local. We’re here to help you plan your vacation by providing information and reviews about things to do, places to eat and everything else Panama City Beach. 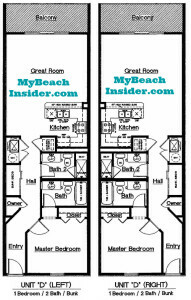 Explore the rest of MyBeachInsider.com now!